What happens when a mysterious space creature blows up your ship on an important mission? Well, like the name suggests, in Crashlands you crash land on a distant planet and are tasked with survival. Are you up for this important challenge? Do you know the folks at Butterscotch games? Well, you might not as this is their first title on Nintendo Switch! They are a prominent developer of mobile applications for both IOS and Android. Will we see more console support from them in the future? Fight, Tame, and more are all viable options when it comes to taking down foes in Crashlands! The main character Flux Dabes works as a galactic delivery truck driver whose latest shipment gets interrupted by an unknown foe. With your ship now to pieces, do you have what it takes to survive on the distant planet of Woanope? You start off with your crashed spaceship and a workbench, what’s next? The game branches you in to start foraging for resources such as wood that’ll allow you to build a better structure for yourself. 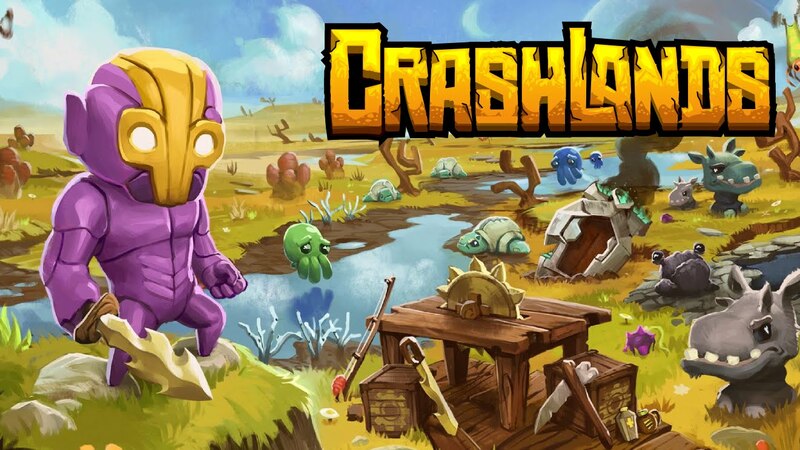 Crashlands features gameplay that is both addictive and similar to those of the likes of Minecraft and Stardew Valley although a cheap/budget version at that. While gathering resources isn’t the only thing to do, you can also take part in various side quests, & boss battles. Traversing the overall map is easy as you’ll find teleporters the more you move around and access different biomes. While all these things take place on the side of your adventure, your main goal is to repair your ship and escape all under secrecy from Hewgodooko. The side quest feature is pretty awesome as well, just find a given NPC and they’ll give you a task such as defeating/finding a mini-boss. Need a certain schematic for crafting? Harvest materials! You’ll often get a rare schematic drop simply by chopping down a tree or fighting enemies. Crashlands also features an immense armor and weapon crafting system that goes along with the above. Once schematics have been found, things such as swords, pickaxes, and different pieces of armor (like helmets & chest pieces). You also have a shot at a random bonus effect that is randomly added to the above once crafted. The game’s visuals and soundtrack aren’t too grand and there isn’t a whole lot to expect on this side of the gameplay. The game was originally built and released for mobile devices and it appears exactly the same on Nintendo Switch with no major improvements. The music though in my mind was quite catchy and fit the overall theme of the game fairly well. Although this is the first game from Butterscotch it feels right at home on the Nintendo Switch. With the game’s mobile roots, the game was simple yet addicting to play while on the go and at home on the TV screen. The addictive gameplay is what sold me on Crashlands alone, and for those Minecraft/Stardew Valley fans you’re sure to enjoy this budget title. Is Crashlands a good title for those looking for a budget title on the Nintendo Switch? In my mind, it is worth the small price tag with the amount of content that is provided. Although the gameplay was addicting in the beginning, it did get a bit more tedious as things went along further in the characters journey. This is apparent as certain materials were needed for certain tasks/crafting recipes and is hard to specifically locate at times. For those looking for a game that has a decent amount of content, a small price tag, and something to pick up and play in short sessions, than Crashlands is the way to go.